Guile, trickery and truth: liar's dice has more than one winning strategy. Keep your opponent guessing about the numbers on your dice. A bluff here, a bit of truth there and you stand a good chance of winning. The objective is to catch your opponent in a lie and call him or her on it. This game fascinates me. It has as much to do with bluffing as rolling the dice well. No two games are quite alike. I find it the most fun to play with 4 to 6 players, but you can play with as few as 2. You can learn how to play liar's dice quickly too! Just read on for rules and strategy tips. This game delivers hours of entertainment. You just supply the pizza and drinks to keep your friends happy. To get started, you can either buy your own dice and cups or buy a liar's dice game with everything you need included. The game's popularity extends into other parts of the world. Known as perudo, dudo or liari in Latin and South America, the history of liars dice can be traced back to the ancient Incans. The game is HUGE in Asia too. # of Players: 2 or more. Equipment: 1 cup per player, 5 dice per player. How to Win: Play the basic game in rounds. Lose 2 rounds and a player is out. The winner is the last player left in the game. The following rules are common to liars dice games. Exceptions or changes do occur when playing different variations of the game. Rule #1: Straights and full houses do not count when forming a hand. Rule #2: "Aces" (one spot or pip on a die), when rolled, are wild. If the player starting the round makes a call of "aces" on the very first call -- for example 4 "aces" -- then aces are not wild for only that hand. If this happens, aces are simply treated as "ones". This is often done as a strategy or, if you're playing with my friends, just to irritate the other players. Note: If a call of "aces" is made and it is not the first call, then they are still wild. In my experience, aces are usually called first or not at all. Rule #3: When aces are wild, any call by a player must include a "real" (or natural) number. A player makes a call that there are a total of 7 "fives". The total # of "fives" counted --including aces-- equals 7. One of the 7 dice must be a "real" five. If they are all aces, the player making the call loses the hand. Rule #4: Players take turns making calls. If more than 2 players are in the game, calls are made in a clockwise circle. Rule #5: If dice become stacked after a roll, the player must pull his/her cup to show everyone and then re-roll them. Rule #6: Any player may challenge the call of another at any time. Rule #7: Each call must be higher than the last. A call of 6 "fours" must be followed by at least a call of 6 "fives" or higher. Let's run through one round between 2 players, Jake and Alex, to see how the game can be played. To begin, Jake and Alex each roll 1 die. Alex rolls the higher number and goes first. His first call: 4 "fours"
Jake's decision: After hearing Alex's call, chooses not challenge it. Instead, he calls 4 "sixes". Alex: With 1 "six" of his own (the ace), he chooses not to challenge. Instead, he calls 5 "threes". Jake: With only 1 "three", Jake challenges the call to see if Alex has 4 "threes" under his cup. He lifts up his cup to reveal 1 "three" (the ace). Alex: Lifts his cup to reveal 3 more "threes", but he falls short of five. Alex loses the round. Mark Twain once said, "Truth is mighty and will prevail. There is nothing the matter with this, except that it ain't so." Perhaps Mr. Twain played liar's dice when he wasn't writing novels. It often isn't what you roll, but what you lead people to believe you've rolled that counts. That's the key to a good strategy. Tip #1: Be unpredictable. Avoid falling into a routine where you make similar calls each time. Tip #2: When aces are not wild, the odds against rolling 4 of a kind are much higher. Tip #3: Whether you won or lost the round, collect the contents of your dice cup quickly. Don't let them sit out in plain view. Players can figure out your strategy or tendencies if they discover you were bluffing about your hand. The following games build upon, or slightly alter, the basic game rules listed above. Equipment: Each player rolls 1 die. Cups are optional, since hands can easily cover 1 die. New Objective: Guess the total number of "spots" on the rolled dice. Example: In a 4 player game, the highest possible total # of spots equals 24 (all 4 players rolling a "six"). TIP: A great game to play with lots of people. Equipment: Same as the basic game rules. Objective: Same as the basic game rules. New Rule: After each player's call, 1 die must be taken from the cup and displayed on the table. The rest are rolled again. As the game continues, there are fewer dice with which to "bluff". New Rule: A player who loses a round, loses a die. A player loses the game when he/she loses all dice. This rule changes the odds by reducing the total number of dice in the game. TIP: If all remaining players have one die, play by the rules of "Elimination Liars" (see above), aka "spots", to determine a winner. If you're a fan of the game, try the electronic liar's dice game. The computer learns your strategy, so you'll need to keep thinking of new ways to bluff your way to a win. If you're looking for a unique version of liars dice, you're in luck. There are two. First, there's an Animal House version, complete with beer cans for use as dice cups and specialized dice, based on the classic comedy with the late John Belushi. Next, fans of Pirates of the Caribbean will recognize the "Pirates" dice game played in the movie. You can even play a free online version of the game on a Disney web site. Just watch out for Captain Jack Sparrow, he's a good player. 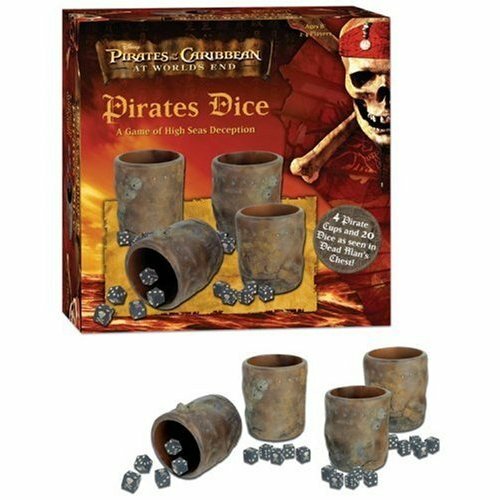 A Pirates of the Caribbean Pirates Dice version of liars dice offers you replica movie props and black dice with skull and crossbones.